The excitement of taking a course from a different major as a multi-field study lasts only a second. There is a constantly growing number of cases in which multi-field studying students are unable to take their desired courses due to the lack of enrollment capacity. 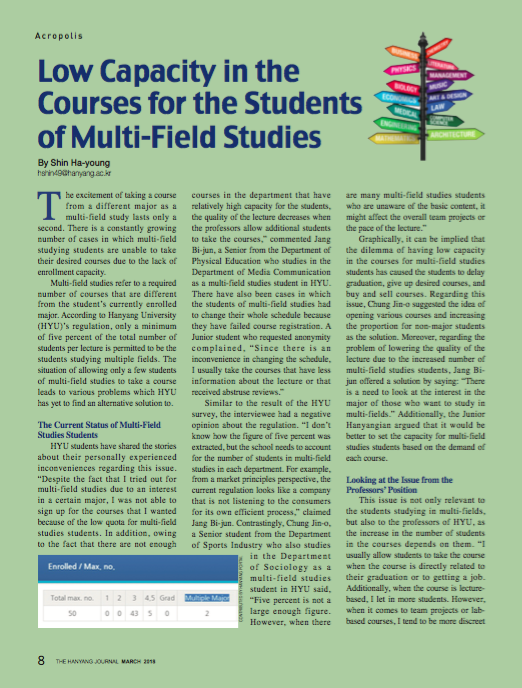 Multi-field studies refer to a required number of courses that are different from the student’s currently enrolled major. According to Hanyang University (HYU)’s regulation, only a minimum of five percent of the total number of students per lecture is permitted to be the students studying multiple fields. The situation of allowing only a few students of multi-field studies to take a course leads to various problems which HYU has yet to find an alternative solution to. Graphically, it can be implied that the dilemma of having low capacity in the courses for multi-field studies students has caused the students to delay graduation, give up desired courses, and buy and sell courses. Regarding this issue, Chung Jin-o suggested the idea of opening various courses and increasing the proportion for non-major students as the solution. Moreover, regarding the problem of lowering the quality of the lecture due to the increased number of multi-field studies students, Jang Bi- jun offered a solution by saying: “There is a need to look at the interest in the major of those who want to study in multi-fields.” Additionally, the Junior Hanyangian argued that it would be better to set the capacity for multi-field studies students based on the demand of each course. Furthermore, Professor Lee Yong- mun, who has been asked in many cases to increase the number of students, commented, “Practically speaking, setting the proportion as five percent is a necessary regulation since it is impossible to open spaces to all the students of multi-field studies.” He also suggested the idea that HYU should follow the guidelines, but also be flexible regarding the issue, so that students who are about to graduate or get a job can have the chance to take the classes. HYU understands and admits that the professors have the authority to increase the number of spaces for the students in their courses. “HYU has no concrete rule yet about allowing more students than the original capacity of the course. Instead, we let the professors decide, as the professors are the ones who know about their classroom environment better than anyone else,” said Jung Joon-ku. The process of getting stressed about course registration amongst the students of multi-field studies and visiting professors to increase the number of seats has been an ongoing tug-of-war. Right now, all we can do is to wait for the system to change. Like the Academic Services Team mentioned before, it takes time to change the whole system, as it is a sensitive problem and cannot be changed easily. However, HYU still needs to continue to examine the seriousness of the problems regarding the issue. If it is difficult to increase the proportion of multi-field studies students, HYU should be able to come up with alternative solutions other than an augmentation of seats.